Super Bowl XVIII on January 22, 1984 featured the defending NFL Champions, the Washington Redskins, against the Los Angeles Raiders. If anything, the Redskins, coached by Joe Gibbs, appeared to be even better in ’83, at least on offense. After losing their opening game, they breezed through the rest of the schedule to again top the NFC East at 14-2. Along the way, they set a new league record for points (541) thanks to a high-powered offense directed by QB Joe Theismann and including RB John Riggins and wide receivers Charlie Brown, Art Monk, and Alvin Garrett along with an outstanding offensive line, known as “the Hogs”. If there were major concerns, they were in regard to the pass defense. The Raiders, coached by Tom Flores, topped the AFC West with a 12-4 record. 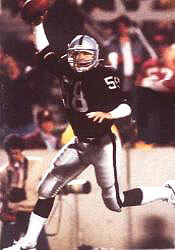 While QB Jim Plunkett had lost his job to Marc Wilson for a time during the season, he played well down the stretch. Second-year RB Marcus Allen (pictured above) was outstanding both as a runner from scrimmage and receiver out of the backfield, TE Todd Christensen caught 92 passes, and veteran WR Cliff Branch was still productive when healthy. The veteran-laden defense was tough and aggressive. The two teams had met during the regular season and the Redskins won an exciting back-and-forth contest in Washington. The defending champs, having thrashed the Rams and then just gotten past the 49ers in the postseason to win the NFC title, were three-point favorites coming into the game. Meanwhile, LA had soundly beaten the Steelers and Seahawks in the playoffs. There were 72,920 fans in attendance at Tampa Stadium. Following their first possession, the Redskins were forced to punt from their 30 yard line. The kick by Jeff Hayes was blocked by TE Derrick Jensen (pictured below), who then recovered it in the end zone for a touchdown to give Los Angeles the early lead. 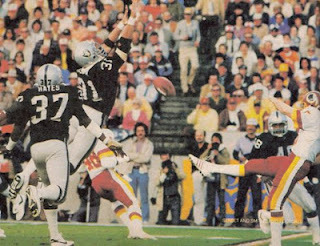 On Washington’s next series, it was the turn of the Raiders to suffer a miscue on a punt as the kick by Hayes hit Los Angeles CB Ted Watts in the back and was recovered by the Redskins. However, they failed to capitalize, gaining just 15 yards before Mark Moseley missed a field goal try from 44 yards out. Both teams had difficulty generating offense in the early going. On the third play of the second quarter, it seemed as though the Redskins might benefit from a botched punt when Ray Guy had to jump for a high snap, but he one-handed it and was able to get the kick away. LA held the Redskins on the next series and, upon regaining possession, came out throwing. Jim Plunkett connected with Cliff Branch down the middle for a 50-yard gain. Two plays later, it was Plunkett to Branch again for a 12-yard touchdown and, with the successful extra point, a 14-0 lead. Down by two touchdowns, the Redskins put together a 13-play, 73-yard series, highlighted by Theismann completing a pass to Alvin Garrett for 17 yards in a third-and-17 situation and throwing to TE Clint Didier twice, for 18 yards and then 20 yards to get inside the LA 20. However, they were unable to reach the end zone as the drive stalled at the seven. Moseley kicked a 24-yard field goal to get Washington on the board. The Redskins got the ball back following a punt by the Raiders at their 12 yard line with 12 seconds left in the half. Theismann, with three receivers set wide to his right, tossed a swing pass to the left intended for RB Joe Washington – a play that had been a big-gainer when the clubs met in the regular season – but LB Jack Squirek stepped in front of the receiver, picked off the pass at the five, and had clear sailing for a touchdown (pictured at left) that made it 21-3 in favor of the Raiders at the half. Washington started the second half strong with a 70-yard scoring drive. Theismann completed three passes and John Riggins ran the ball six times, the last on a one-yard plunge into the end zone for a TD. However, TE Don Hasselbeck blocked Moseley’s extra point attempt to keep the score at 21-9. The Raiders responded with a 70-yard drive in eight plays that was helped along by a 38-yard pass interference penalty on CB Darrell Green. 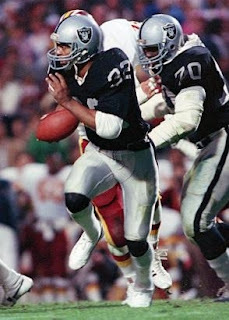 Los Angeles converted a third-and-four play at the Washington 11 as Plunkett threw to FB Frank Hawkins for six yards and Marcus Allen capped the series with a five-yard touchdown carry. Trying to keep up, the Redskins were unable to convert on fourth-and-one at the LA 26 and, on the last play of the third quarter, Allen made a big play that, for all intents, finished off the defending champs. With a first down at the LA 26, Allen took a pitchout from Plunkett and began to sweep to his left. However, with SS Ken Coffey fast approaching, he reversed field and had clear sailing to a 74-yard TD. It set a new Super Bowl record for longest run, eclipsing the 58-yard carry by Tom Matte of the Colts in Super Bowl III. More importantly for the Raiders, it put Washington in a very deep hole at 35-9. The fourth quarter was anticlimactic. The Raiders added a 21-yard field goal by Chris Bahr following an interception by CB Mike Haynes and came away with a stunning 38-9 win. It was the most points scored in a Super Bowl up to that time, as well as a record victory margin. LA had more total yards (385 to 283) although the Redskins generated more first downs (19 to 18). But, critically, Washington was only able to gain 90 yards on the ground, averaging 2.5 yards per carry as the Raiders typically dominated the line of scrimmage. In addition, the Los Angeles defense sacked Theismann six times and the Redskins turned the ball over three times – once directly for a score – as opposed to two turnovers by LA. NT Reggie Kinlaw was a big part of the successful effort against the ground game while cornerbacks Mike Haynes and Lester Hayes blanketed wide receivers Charlie Brown and Art Monk. 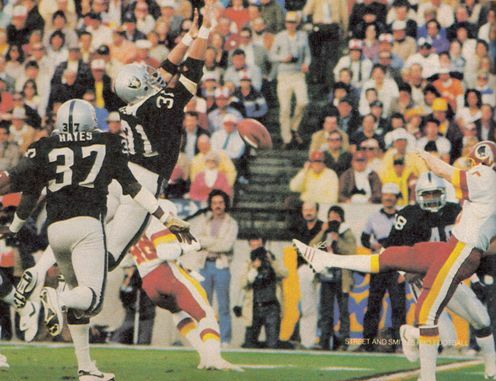 Marcus Allen was the game’s MVP as he rushed for 191 yards on 20 carries that included two touchdowns; the rushing total set a new Super Bowl record, breaking that of John Riggins set a year earlier. Jim Plunkett completed 16 of 25 passes for 172 yards and a TD with none intercepted. Cliff Branch (pictured at right) caught 6 passes for 94 yards and a score. For the Redskins, the continually-harassed Joe Theismann was successful on 16 of 35 throws for 243 yards with no touchdowns and two picked off. John Riggins was held to 64 rushing yards on 26 carries and scored a TD. Clint Didier led the club with 5 pass receptions, for 65 yards, while Charlie Brown gained 93 yards on his three catches. “What hurt the most was the Raiders coming back right after we scored at the start of the third quarter,” echoed Charlie Brown in summing up the defeat. “This is the first time since Joe Gibbs has been here that any team has controlled our offense the way the Raiders did,” Joe Theismann noted. The Raiders were 11-5 in the highly-competitive AFC West in 1984, reaching the postseason as a Wild Card team and losing to the division-rival Seahawks in the first playoff round. Washington topped the NFC East again in ’84, but also fell short of a return to the Super Bowl with a loss to the Bears in the Divisional round of the playoffs. The Redskins would win another NFC title in 1987, by which time such stalwarts as Joe Theismann and John Riggins were long gone.